Bionic eye implants are finally hitting the market — first in Europe, and hopefully soon in the U.S., ExtremeTech reports. These implants can restore sight to completely blind patients — though only if the blindness is caused by a faulty retina, as in macular degeneration. The first of these implants, Argus II, developed by Second Sight, is already available in Europe. For around $115,000, you get a 4-hour operation to install an antenna behind your eye, and a special pair of camera-equipped glasses that send signals to the antenna. The antenna is wired into your retina with around 60 electrodes, creating the equivalent of a 60-pixel display for your brain to interpret. The first users of the Argus II bionic eye report that they can see rough shapes and track the movement of objects, and slowly read large writing. 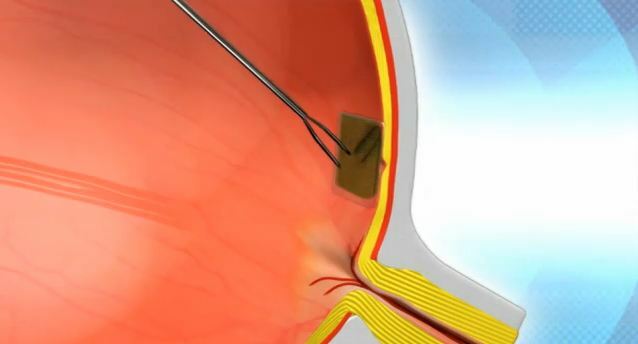 The second bionic eye implant, the Bio-Retina developed by Nano Retina, is a whole lot more exciting. The Bio-Retina costs less — around the $60,000 mark — and instead of an external camera, the vision-restoring sensor is actually placed inside the eye, on top of the retina. The operation only takes 30 minutes and can be performed under local anesthetic. Basically, with macular degeneration and diabetic retinopathy, the light-sensitive rods and cones in your retina stop working. The Bio-Retina plops a 24×24-resolution (:L!) sensor right on top of your damaged retina, and 576 electrodes on the back of the sensor implant themselves into the optic nerve. An embedded image processor converts the data from each of the pixels into electrical pulses that are coded in such a way that the brain can perceive different levels of grayscale. The Bio-Retina system comes with a standard pair of corrective lenses that are modified so that they can fire a near-infrared laser beam through your iris to the sensor at the back of your eye. Human trials of Bio-Retina are slated to begin in 2013. .